Over Memorial Day Weekend, I took Erin out on a day/night on the town to celebrate her college graduation--we began with a Saturday matinee to see Daniel Radcliffe in the Broadway revival of How to Succeed in Business Without Really Trying followed by a lovely four-course dinner at Chef Michael White's Ai Fiori. Ai Fiori (Italian for "among the flowers") celebrates cuisine from the Italian and French Riviera, showcasing "modern interpretations of traditional regional dishes" on its menu. After visiting Chef White's Osteria Morini last year (which served up quite the delicious Italian-style brunch), I was anxious to see what his next culinary creation (be it, a more formal one) had to offer. 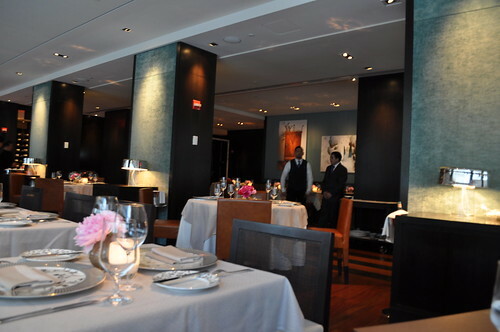 When I saw the beautiful slide show alongside Sam Sifton's glowing three-star restaurant review for Ai Fiori in The New York Times, I knew a visit must be had. 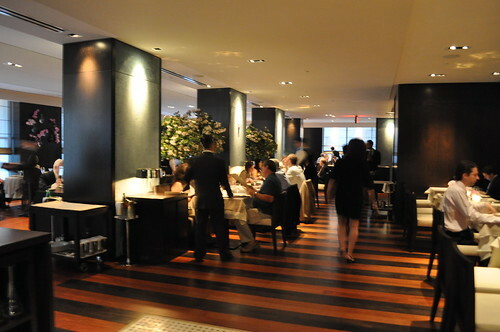 Despite the opinions of Mr. Sifton (along with that of Adam Platt of New York magazine) regarding the second level space of The Setai Fifth Avenue boutique hotel in which Ai Fiori occupies, I actually enjoyed the restaurant's ambiance and darker interiors. I didn't find it to be "colored in gloomy shades of brown and green" (per Mr. Platt) or filled with an "atmosphere of bland corporate-culture" (per Mr. Sifton) one bit. I really liked the softness of the colors inside the restaurant, making the atmosphere less stuffy than I had initially anticipated--I truly felt like I was "among flowers" from its color scheme. 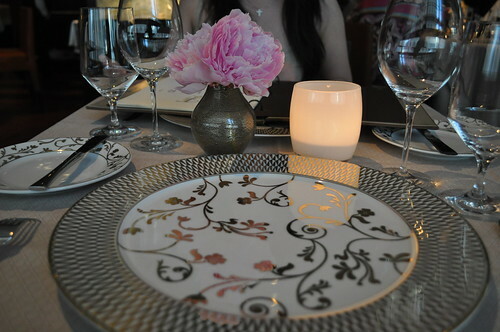 Even the intricately designed china complements the restaurant's interiors and theme of being among flowers along with the small vase of peonies! 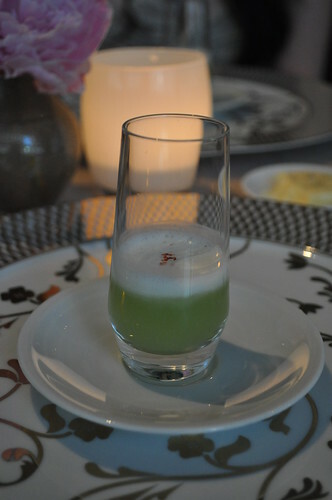 The kitchen started us off with an amuse-bouche of chilled cucumber soup with horseradish and Italian pepper. I don't normally like chilled soups, especially ones made from cucumber, but I actually found this to be quite refreshing with a little zest from the horseradish and pepper at the top. It was also the ideal amount--pretty much just a shot of soup, which didn't feel like too much or too little. Erin and I each decided to go with the four-course prix fixe (as recommended by the restaurant itself), which includes a cominciare (i.e., a course "for starting"), a pasta or risotto, a pesce or carne (i.e., fish or meat), and a dolce (i.e., dessert). I know my best friend too well. 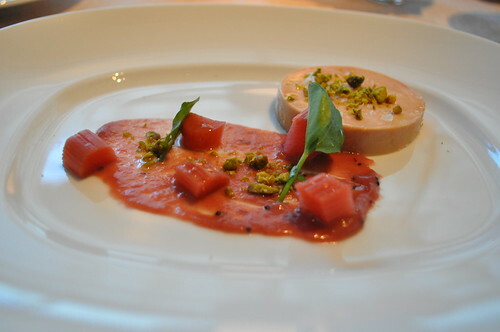 When I perused the menu, I immediately knew she was going to order the torchon, which was foie gras au naturel with rhubarb mostarda and pistachios as her per cominciare. 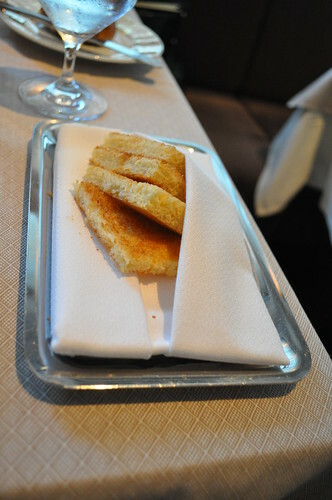 And as always, along with foie gras in paté form, was a few slices of fresh brioche toast. She enjoyed it very much, as it had the essence of a classic foie gras terrine (smooth, rich, and buttery) with the added refreshing rhubarb and the earthy, crunchy pistachios. I'd have to say the pistachios were by far my favorite part of this foie gras dish. I started with the uovo (Italian for "egg"), which was a slow poached egg with lobster knuckles, crispy veal shortbreads, and nuage lemon. 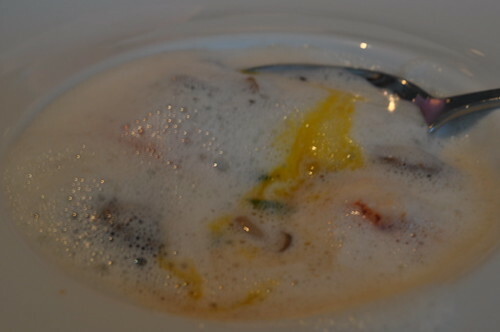 The composition of the course was seemingly a really light soup (airy, because of the foaminess) with a slowly poached egg at its center. 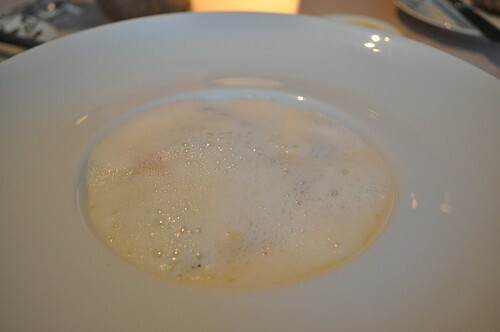 Nuage is actually French for "cloud" so the "lemon cloud" was the foamy coat over the dish's remaining ingredients. Lobster knuckles (i.e., the parts that join the lobster's claws and its body) hold very sweet and tender meat. In this particular preparation, the lobster knuckles were still warm and very tender with a buttery taste from the nuage lemon, pairing well with the runny yolk and silky egg whites. I pierced the egg so the yolk would run through the rest of the dish. As I've mentioned before, I'm a "ratio eater" in that I like to eat my food with all of the ingredients fused somehow (as opposed to in order, ingredient by ingredient), so what I did here shouldn't be all that surprising (plus, I think that's what you were supposed to do, haha). The lobster was indeed very sweet tasting as well as tender in texture, while the sweetbreads were seared to be very flavorful and soft on the inside. This was definitely one of my favorite things that I've had this year so far--I haven't quite had anything like it before, which made for a great introduction to the rest of the courses that were to come. 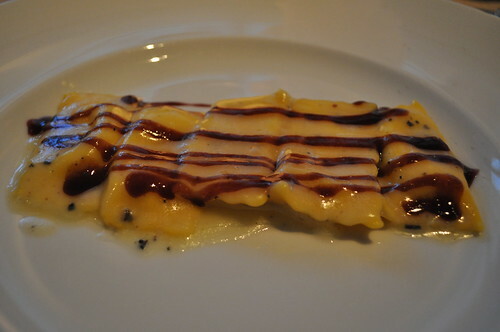 For her second course, Erin had the tortelli (i.e., small, filled pasta parcels), which was a ricotta and marscarpone ravioli with boschetto cheese and a red wine glaze. Given how many creamy aspects there were to this pasta, it was surprisingly light on the stomach. The cheese glazed on top was super thin, almost the same thickness of a shed snakeskin. 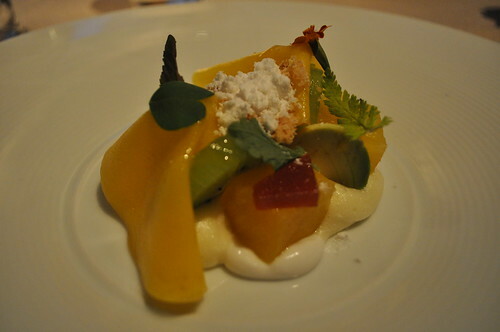 The ricotta and marscarpone had a favorable portioned ratio with the tortelli pasta dough. The portion overall was a great lead-in for the two remaining courses. 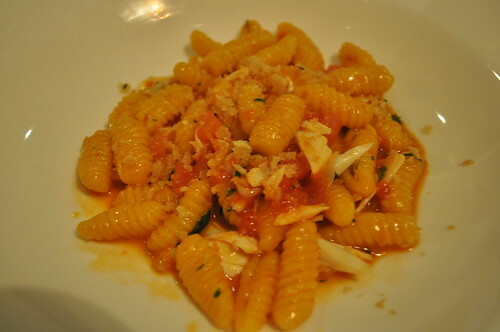 As my second course, I went with the gnocchetti, which was a semolina saffron gnocchi with blue crab, sea urchin, tomato, and fresh herbs. This reminded me of a similar (if not identical) dish I had at Convivio back in December of last year (before the White-Cannon restaurant divorce and before it subsequently closed, of course). It was called the malloreddus, a Sardinian pasta that resembles gnocchetti but is infused with saffron, served with crab and sea urchin. It was nice to see the dish reincarnated in one of Chef White's restaurants, post-closing of his formerly-owned Convivio and Alto. The gnocchetti was really fresh with a chewy texture from the semolina. 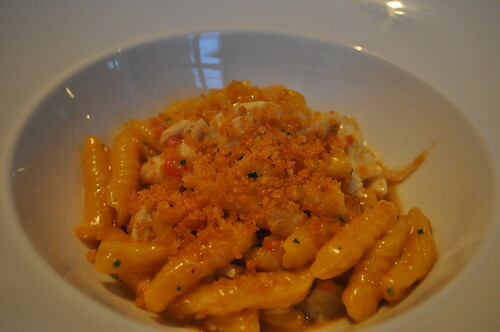 The bread crumbs added a really great crunch to the rest of the soft textures of the crab and the gnocchetti. The sea urchin mixed in throughout was by far my favorite part of this dish -- it brought all the ingredients together, as a cohesive unit, with fully rich encompassing flavor. This isn't a pasta dish I've seen very often in American Italian restaurants, which made the experience that much more authentic. 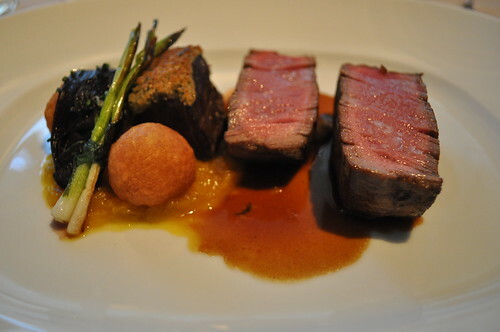 Erin went with the filetto as her main course, which was a seared filet of beef with crisp pommes dauphines (i.e., deep-fried croquettes made by combining potato puree with choux pastry (i.e., creampuff pastry dough), saffron onion, and bordelaise. It was very tender and cooked to the perfect temperature. And hey, any beef course that is served with bordelaise is always an A+ in my book (so long as the beef is cooked to the ideal medium-rare temperature)! 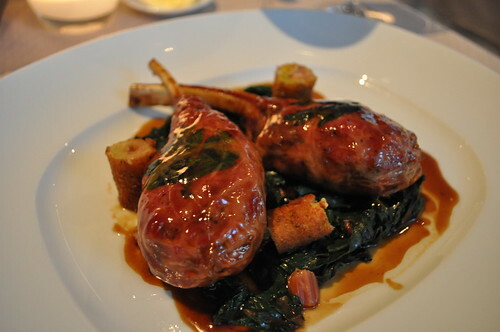 As my main course, I chose the agnello (Italian for "lamb"), which was a rack of lamb en crépinette (i.e., lamb chops covered in a "sausage parcel" of ground lamb and foie gras wrapped in caul fat, with a "crest of parsley" between the fat on each chop). It was served with swiss chard crochetta (French for "croquette) and sarriette (an herb from Provence that is sometimes referred to as "savory"). I remember first hearing about this dish (as well as seeing it for the first time) as a part of Sam Sifton's restaurant review on it in The New York Times (see slide no. 8). Normally, Marcus and I wouldn't normally be too keen on using the word decadent to describe food (let alone anything else), but this course was really decadent. Delicately wrapped in small, flattened sausage, the lamb chops were cooked with a nice warm center and a nice hint of red. What I didn't realize, however, was that "en crépinette" meant it was wrapped in thin sausage meat -- I probably should have done a better job listening to our captain. While the sausage wrapping was really good, it was just a little too much meat for me, as I was already starting to get full from the first two courses, so I only really had the lamb chop meat. So if you decide you want to order the agnello, I would only have one course before it, so you have enough room in your stomach to fully enjoy it! 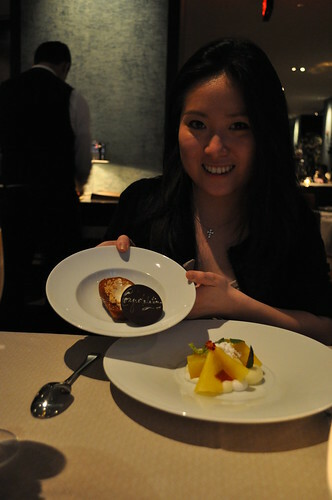 For dessert, Erin ordered the baba al rhum, which had tropical fruit, passion fruit coulis, and crema di coco. This was a very light and fruity dessert topped with a little creaminess. 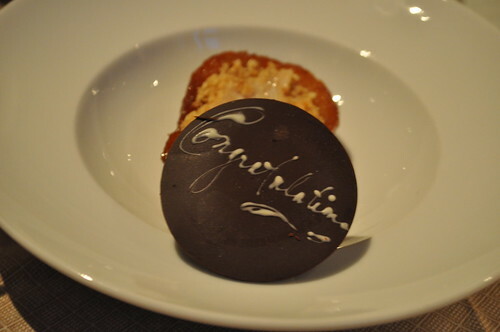 The restaurant also surprised Erin with a congratulatory dessert! It even had "Congratulations" written on a disk of thin, dark chocolate! If I recall correctly, the dessert was reminiscent of bread pudding with some anglaise, but I could be wrong. In either case, it was really good! For dessert, I had the tartaletta, an Italian tart with dark chocolate, grapefruit, anise (an aromatic Mediterranean herb), and hazelnut gelato. 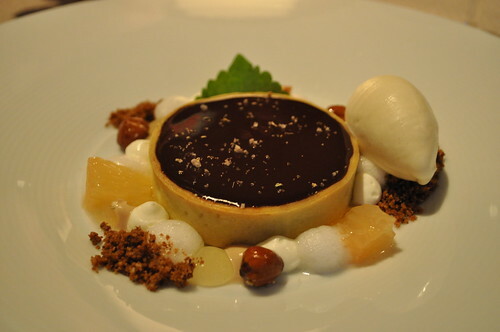 It had everything I look for in a dessert (dark chocolate, check; hazelnut in some form, check; gelato, check) where it is lightly savory and bitterly sweet. It being a tart was a lovely bonus on top of everything else. I highly recommend this! 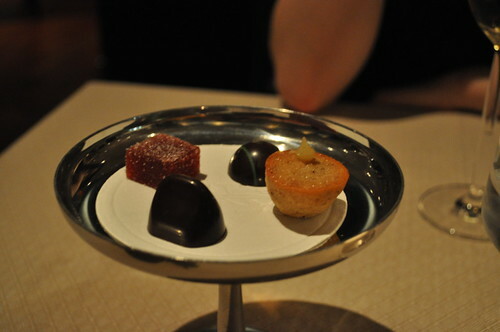 Some mignardises to end our four-course meal. 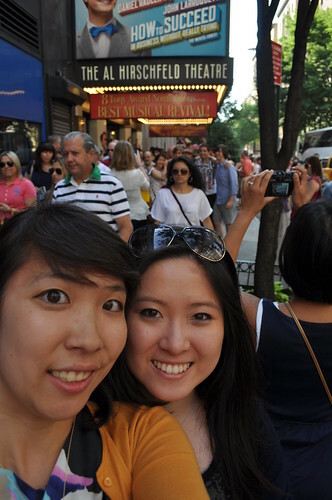 Erin and I at How to Succed in Business Without Really Trying before heading over to Ai Fiori. 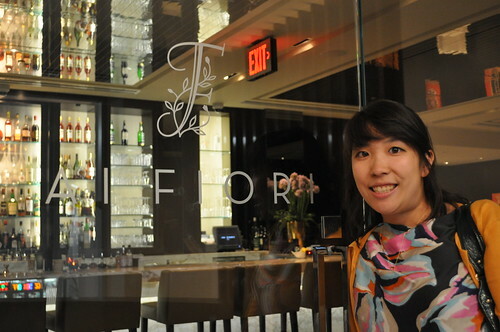 Findings: I found my experience at Ai Fiori to be lovely and very pleasant. The four courses we had were very authentic to the French and Italian Riviera and were executed to fully satisfy any palate that appreciates really amazing food. Chef White did wonders for the items we chose in our prix fixe, so I'm curious to return to try the other items. What impressed me the most were the two pasta courses that Erin and I had -- the freshness and the ideal consistency of the pasta (made in house, no less) made what would have been an ordinary, expectant pasta dish be that much better. There were other pasta offerings that I'd love to try during a future visit. However, while the agnello was beautiful in presentation, meaty in taste, and succulent in texture, I found the "en crepinette" sausage meat surrounding the lamb was a little overwhelming. I definitely would have enjoyed a lot more if I hadn't already had those two courses before! Nevertheless, my favorites among the night were the torchon, the uovo, the gnocchetti, the filetto, and the tartaletta. Also noteworthy to mention is the great service experience we had with our captain and the rest of the waitstaff. They were warm and friendly as well as resourceful and helpful when asked upon. The atmosphere at the restaurant was pretty quiet, but not to the point where you felt stuffy and uncomfortable. It was a relaxed environment, living up to the restaurant's name, where you could imagine yourself in a garden, ai fiori (i.e., among flowers). I was very fortunate that the restaurant was kind enough to let me snap a few shots (I was quite diligent in making sure I wasn't disturbing other guests) because I just recently read this article in Grub Street about taking pictures at restaurants and how certain establishments (Ai Fiori included) have certain views (sometimes strict) on customer photography. I guess this made me like the restaurant even more -- the people in charge over there knew what I was up to, that I wasn't out to disturb anyone. I was just trying to document one hell of a meal in the best way I could. Besides, what four-course prix fixe are you going to find that is filled with deliciously awesome menu choices that will only cost you $84 where you'll leave satisfyingly full? Price point: $84 each for a four-course prix fixe ($5 supplement for the torchon).